Dianella tasmanica ‘Variegata’ comes from South East Australia, this is a grass-like perennial that is grown for it’s bold white stripes. Mid Spring this Lily will produce clusters of small lavender blue flowers, these will be followed by electric blue berries. 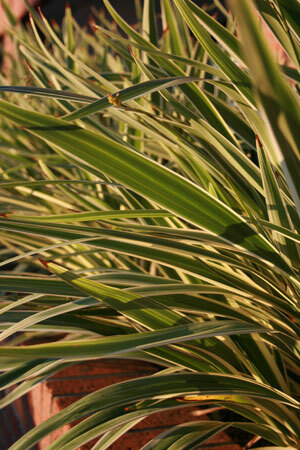 Variegated Flax Lily is drought tolerant once established, clump forming, growing up to 15-18″ tall with a 12″ spread.